Blogger Brenden Nickels is a senior office assistant at Kraus-Anderson’s Twin Cities office. Let’s say you get into work, and you want a cup of coffee. You have the choice of pouring from a pot that was made three hours ago, or from a pot that was made three minutes ago. Which one would you choose? I’m sure you would choose the one that made three minutes ago, because it was the fresher one. For some reason, food just seems to taste better when it’s fresh, and downtowners have a way on how to get that food fresh: The farmers market. The Minneapolis Farmers Market is a sure sign of summer on the Nicollet Mall. The Minneapolis Farmers Market on Lyndale Avenue, north of downtown, has operated Thursday markets on Nicollet Mall for years. 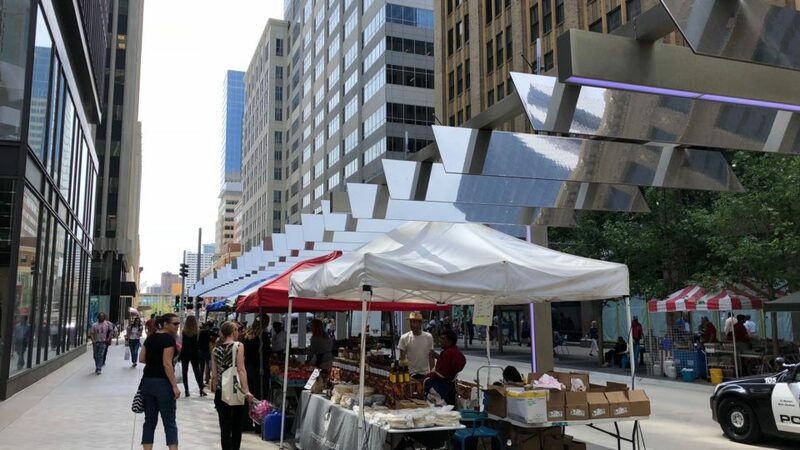 During Nicollet Mall’s recent renovation, the market was temporarily moved to the Hennepin County Government Center. That turned out to be such a hit that the Farmers Market is now also available there as well this summer on Tuesdays. Some vendors I have seen at both of these markets, since they are always looking for ways to attract customers, like any other business would. There are also some independent farmers markets that run in our city’s East Town district as well. The Mill City Farmers Market operates in the Mill District between the Guthrie Theater and Spoonriver, a restaurant known for organic vegetarian food. They also operate during the winter inside the Mill City Museum. This farmers market is focusing on organic food, too; in fact, it was formed by Brenda Langton, the same chef who formed Spoonriver, as well as the now-defunct Café Brenda. A good thing about this farmers market is you can not only pay in cash, but you can also use a credit/debit card to buy $5 tokens that you can use to buy food from vendors, or if you use food stamps, you can use your EBT card to acquire $1 tokens to also use for purchases. Our next-door neighbor FINNEGANS have now also gotten into the farmers market business too. 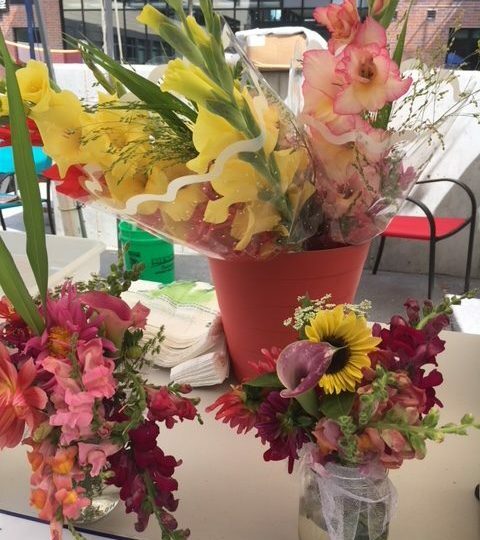 Every Friday this summer, a variety of local vendors set up shop in the courtyard behind the KA headquarters, HQ Apartments, and the Finnegans brewery/taproom. In addition, there are games you can play, such as beanbag toss, chess, foosball, and a volleyball net. You can also just sit down and relax, or bring your lunch outside and eat it there. It serves as another amenity to everyone who is in the area, whether working here at Kraus-Anderson, living in the HQ Apartments, or just stopping by the brewery for a beer. The Minneapolis Farmers’ Market is at Nicollet Mall Thursdays from 6am-6pm, and at the Government Center Tuesdays from 9am-3pm. And of course, the main Farmers Market is up and running each morning from 6 am-1 pm. The Mill City Farmers Market is open Saturdays from 8 am-1 pm, and at The Commons starting June 5 on Tuesdays from 4 pm-8 pm. Finnegans Market is every Friday from 3-7 pm. in the courtyard through September. It may be a little different than just going to the grocery store, but at least you know exactly where your food came from and who grew or raised it. Good information for us new to KA and/or working in Mpls, thanks!